Wireless phone chargers like those rumoured to be included with the next iPhone are great and all, but they have some pretty major drawbacks. The most notable is that the transmitter and receiver have to be sitting pretty much still for the charging to work. The reason is that the frequency of the signals in this form of wireless power transfer – known as magnetic resonance coupling – needs to be tuned to the right distance. Continuously and automatically detecting that distance is a complex task. But new research from Stanford University engineers suggests that it may not be impossible. A team led by Shanhui Fan – a professor of electrical engineering and senior author on a study describing the research published in Nature – has successfully managed to wirelessly transfer energy to a moving LED lightbulb. They did it by replacing key components of the transmitter with a commercially-available voltage amplifier and feedback resistor. That lets the system automatically figure out the right frequency for different distances without human interference. 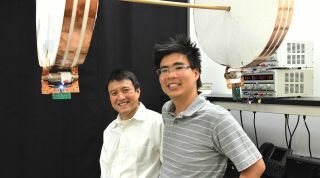 “Adding the amplifier and resistor allows power to be very efficiently transferred across most of the three-foot range and despite the changing orientation of the receiving coil,” said graduate student Sid Assawaworrarit, the study’s lead author. So far power transfers on the system have been very small – a single milliwatt, whereas charging and electric car requires something like ten million times that quantity. But the distance that the electricity can be transferred is already sufficient. “We still need to significantly increase the amount of electricity being transferred to charge electric cars, but we may not need to push the distance too much more,” said Fan.